OBJECTIVE(S): Diagnostic transgastric endoscopic peritoneoscopy (DTEP) has been used as a staging tool to evaluate the abdomen via a natural orifice. Visualization of the abdominal wall is excellent after transgastric endoscopic access. We now present our experience with transgastric endoscopic peritoneoscopy (TEP) to direct trocar placement and adhesiolysis in patients undergoing laparoscopic roux-en-y gastric bypass procedures (LSRYGB). METHODS: Forty patients scheduled to undergo LSRYGB for the treatment of morbid obesity will participate. There are two arms to the study. The initial 20 patients will undergo preinsufflation of the abdomen prior to TEP. The second 20 will have no preinsufflation. Ten patients in each arm have no history of abdominal operations. The other 10 will have had previous intra abdominal procedures. TEP is performed through a gastrotomy created using an orally placed gastroscope without laparoscopic visualization. Trocars are placed under endoscopic guidance. The gastrotomy is incorporated into the gastrojejunostomy. Diagnostic findings, operative times and clinical course are recorded. RESULTS: Thirty-five patients have completed the protocol to date. The average time for completion of the endoscopic intervention was 19 min. Three patients had limited visualization due to significant intra abdominal and omental fat (1) or adhesive disease (2). Three of the 19 who had no previous surgeries and 13 of 15 with a history of intra abdominal interventions had adhesions visualized endoscopically. Endoscopic adhesiolysis was performed in one and four patients in these groups respectively. Six occult umbilical hernias and one hiatal hernia were noted on endoscopic exploration. There were no complications related to intubation of the stomach, creation of the gastrotomy, or exploration of the abdomen. 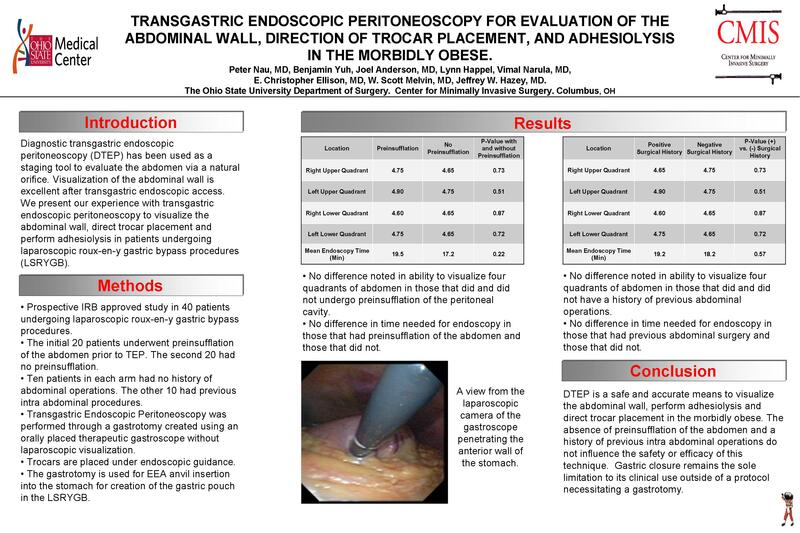 CONCLUSIONS: TEP is a safe and accurate means to visualize the abdominal wall, perform adhesiolysis and direct trocar placement in the morbidly obese. Gastric closure remains the sole limitation to its clinical use outside of a protocol necessitating a gastrotomy.